Politics without God: Last Chance to Pledge to Fund a New Paper on Abortion Rights! Last Chance to Pledge to Fund a New Paper on Abortion Rights! I'm delighted to report that the pledge drive to fund Ari Armstrong's and my new policy paper in defense of abortion rights is rolling along on schedule. So far, we've received 28 pledges for $1,560. That's over the threshold -- HOORAY! So thank you, thank you to everyone who has pledged so far! However, I'd love to collect a bit more in funds before tomorrow's deadline, if possible. Why? First, some people don't pay their pledges, so I'd like a bit of wiggle room for that. Second, I'd love to use any extra funds to promote the paper after it's completed. Third, a bit more money raised would be good for CSG's court challenge to Colorado's campaign finance laws. You have until tomorrow at midnight to pledge. Please do pledge, if you want to support this project! Any amount is welcome, and your pledge is not due until the paper is published on September 17th. You can find out more about Colorado's 2014 "personhood" ballot measure here. If you have any questions about the project or pledging, please email me. While we need staunch defense of abortion rights everywhere, this project is of personal interest to me because my daughters live in Colorado, and I want them to have the fullest protection of their rights possible there. Thank you for using sane reasoning to argue for positions that I care about. I support your cause, and wish that as a student I could contribute more. Hopefully soon as a professional I can help more. It's very important that you write this. 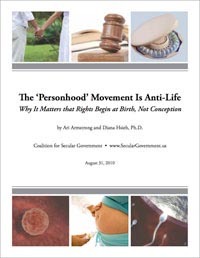 Personhood laws destroy reproductive rights, and destroys Republicans' commitment to and reputation for supporting freedom and individual rights. I am looking forward to the updated paper. I found the original very interesting and informative. Keep up the good work! Look forward to the update and to the defeat of Amendment 67. Me too!! Again, please pledge before tomorrow at midnight if you want to support the writing and promotion of a new paper in defense of abortion rights! Pledge to Fund a New Paper on Abortion Rights!